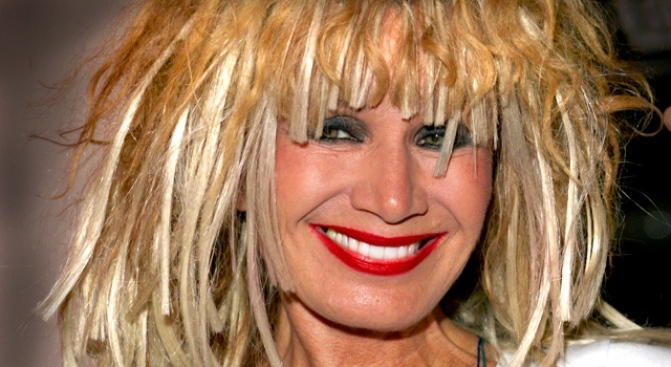 The indomitable designer Betsey Johnson is reportedly planning to retire. One lucky New York writer certainly got an earful from Betsey Johnson at the party for By Invitation Only (a novel based in the Hamptons). Then, out of the blue, Johnson embarked on one of her trademark stream-of-consciousness rants (oh, Betsey, how we love your rants! ), wherein she revealed how really she "should be retired." She went so far as to say, "I’m basically screwing up because I’m not retired." What's more, she even knows who she'd want to step in as lead designer! Eric Santori, who's previous designed for labels like Herve Leger, Azzedine Alaia, and Vera Wang. "'He is the one,' she says. 'He’s much better than I am. He just has to Betsey-fy himself.'" Um, does that mean dye his hair, embrace tulle, and learn how to turn a mean cartwheel? Betsey! What are we going to do without you? !